The 38 metre motor yacht Apola, listed for sale by Marat Urusov at IYC Russia, has been sold with the buyer introduced by James Greenwood at Worth Avenue Yachts. Designed by Francesco Paszkowski, Apola was built in aluminium by Italian yard Rodriquez to RINA class and delivered in 2007 with a major refit in 2015. Accommodation is for up to 13 guests in five cabins consisting of a full-beam master suite, a VIP suite, a double and two twins, all with entertainment centres, television screens and en-suite bathroom facilities. In addition, seven crew are accommodated in four cabins. An expansive main saloon has comfortable seating for all guests in the lounge area aft, a formal dining area with seating for 10 guests forward and an entertainment centre including a Samsung 50-inch television screen, home cinema and a karaoke system. The aft deck is particularly large, offering plenty of room for al fresco entertaining and dining, while the sun deck offers U-shaped seating, an ice maker, bar and a selection of sun pads and loungers. 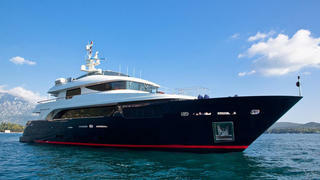 Twin 1,825hp Caterpillar diesel engines give her a cruising speed of 10 knots topping out at 17.5 knots.